Overtraining syndrome (OTS), functional (FOR) and non-functional overreaching (NFOR) are conditions diagnosed in athletes with decreased performance and fatigue, triggered by metabolic, immune, hormonal and other dysfunctions and resulted from an imbalance between training stress and proper recovery. Despite previous descriptions, there is a lack of a review that discloses all hormonal findings in OTS/FOR/NFOR. The aim of this systematic review is to evaluate whether and which roles hormones play in OTS/FOR/NFOR. 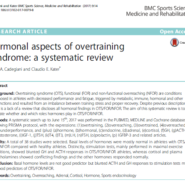 A systematic search up to June 15th, 2017 was performed in the PUBMED, MEDLINE and Cochrane databases following PRISMA protocol, with the expressions: (1)overtraining, (2)overreaching, (3)overtrained, (4)overreached, or (5)underperformance, and (plus) (a)hormone, (b)hormonal, (c)endocrine, (d)adrenal, (e)cortisol, (f)GH, (g)ACTH, (h)testosterone, (i)IGF-1, (j)TSH, (k)T4, (l)T3, (m)LH, (n)FSH, (o)prolactin, (p) IGFBP-3 and related articles. A total of 38 studies were selected. Basal levels of hormones were mostly normal in athletes with OTS/FOR/NFOR compared with healthy athletes. Distinctly, stimulation tests, mainly performed in maximal exercise conditions, showed blunted GH and ACTH responses in OTS/FOR/NFOR athletes, whereas cortisol and plasma catecholamines showed conflicting findings and the other hormones responded normally. Basal hormone levels are not good predictor but blunted ACTH and GH responses to stimulation tests may be good predictors of OTS/FOR/NFOR.